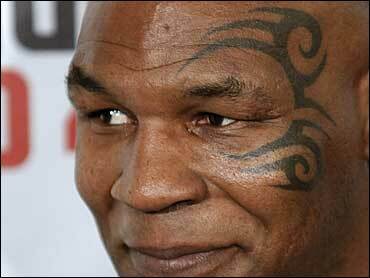 Former heavyweight champion Mike Tyson's 4-year-old daughter is on life support after she was found with her neck on a treadmill cable Monday, Phoenix police said. Police Sgt. Andy Hill said the "tragic accident" happened Monday morning at a Phoenix home when the girl's 7-year-old brother found her on a treadmill with her neck on a cable attached to the exercise machine. The boy told the girl's mother, who had been cleaning in a separate room. The mother took the girl off the cable, called 911 and tried to revive her. Responding officers and firefighters performed CPR on the girl as they rushed her to a nearby hospital, where she was in "extremely critical condition" and on life support, Hill said. "Somehow she was playing on this treadmill, and there's a cord that hangs under the console - it's kind of a loop," Hill said. "Either she slipped or put her head in the loop, but it acted like a noose, and she was obviously unable to get herself off of it." Hill said Tyson was in Las Vegas when the accident occurred but flew to Phoenix immediately after learning of the accident. Tyson could not immediately be reached for comment. Calls to three of his representatives were either not returned or went unanswered. Hill said everything in the investigation pointed to the incident being an accident. "There's nothing in the investigation that revealed anything suspicious," he said. Hill said he had never seen an accident exactly like the one involving Tyson's daughter, but added that children have accidentally choked themselves on curtain cords in the past. "When a child gets on life support it takes a while for a family to work through that process, deciding what to do," he said. "There still is hope for the child to come out of it." He added that responding to calls involving children is an officer's most difficult duty. "Those are the things that stay with you in your career," he said. "We always home for a miracle - not to have the worst happen to a child."